An electronic book (variously: E-BOOK, eBook, e-Book, ebook, digital book, or even e-edition) is a book-length publication in digital form, consisting of text, images, or both, readable on computers or other electronic devices. Although sometimes defined as "an electronic version of a printed book", many e-books exist without any printed equivalent. Commercially produced and sold e-books are usually intended to be read on dedicated e-book readers, however, almost any sophisticated electronic device that features a controllable viewing screen, including computers, many mobile phones, and all smartphones can also be used to read e-books. COMPARISON OF E-BOOK FORMATS - Wikipedia. 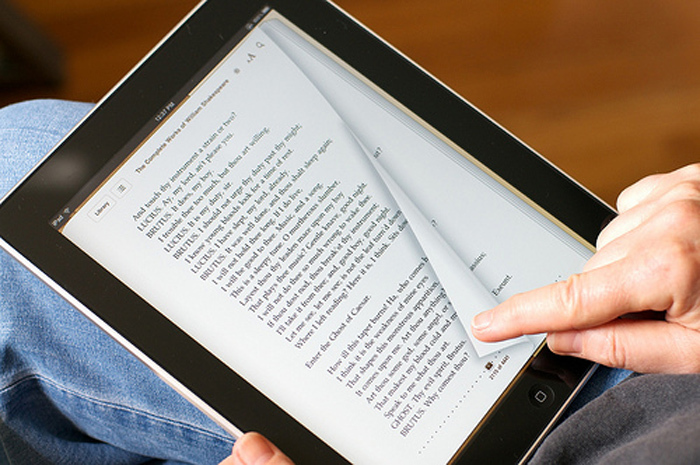 E-Book Sales Slip, and Print Is Far From Dead - The New York Times. How to download e-books from your local library - CNET. HOW TO GET FREE KINDLE BOOKS WITH YOUR LIBRARY CARD - Wired. THE DIGITAL READER - "Read More, Carry Less." News, review, & opinion blog. BARNES & NOBLE - over 1 million titles! Belle Bridge Books - "Books for every reader's imagination." BOOKS-A-MILLION - eBooks, bestsellers, hard-to-find books. BOOKTRACK - "Soundtracks for Books." A new chapter in the evolution of storytelling, and an industry "first" in publishing, by creating synchronized soundtracks for e-books that dramatically boost the reader's imagination and engagement. Booktrack is already well on its way to creating a new genre of entertainment. Download Booktracks in the Apple App store for your iPhone, iPad, and iPod Touch. CLASSIC LITERATURE LIBRARY - free public domain ebooks and classic books. DAILYLIT - "DailyLit lets you read literary classics and great new fiction in short installments that you can pick up and put down anytime. Once you’ve found a book, just select when you want your installments to arrive in your inbox." DE GRUYTER - the De Gruyter e-dition makes over 60,000 high-quality titles available from De Gruyter’s more than 260-year publishing history. Forgotten Books - "Read free books online at Forgotten Books." 484,473 free books. Largest online eBooks library. GOOGLE E-BOOK STORE - "Buy anywhere, read anywhere." More than 3 million Google eBooks. Harlequin - "Entertain, enrich, inspire." IBOOKS - for iPhone, iPod touch, and iPad on the iTunes App Store. INDIEBOUND BOOKSTORE - offers more than 4 million eBook titles. Kensington - America's Independent Publisher." KINDLE E-BOOK STORE - as of May 10, 2014: 2,644,690 titles. Kindle Unlimited - "Enjoy unlimited access to over 600,000 titles and thousands of audiobooks on any device for just US$9.99 a month." KOBO - "With Kobo, you can browse, search, buy and read your favorite eBooks on just about any device you choose - from select Smartphones, tablets, computers, eReaders and more." Ludvig Holberg’s Writings - "Ludvig Holberg (1684–1754) is one of the main figures of the Scandinavian Enlightenment. His numerous and multifaceted writings occupy a central position in the literature of both Denmark and Norway. This is the first digital critical edition of Holberg’s collected writings. The texts are fully searchable and equipped with commentaries, introductions, critical apparatus, and facsimiles." Metabook - "for iPad and iPhone." The new patent-pending digital publishing platform and reading experience for the 21st Century. Open Library - "Open Library is yours to borrow, read & browse." The World's classic literature at your fingertips. Over 1,000,000 free ebook titles available. Oyster - since 2012. "Oyster is simply the best way to read." Streaming service for digital ebooks, available for Android, iOS, Kindle Fire, and NOOK HD/HD+ devices. It is also available on any web browser on a desktop or laptop computer. Oyster holds over 1 million books in its library, and as of September 2015, the service is only available in the United States. PENGUIN EBOOKS - "Whether you're looking for something new, want to catch up on the latest bestsellers or just fancy browsing, we have something here for everyone." POTTERMORE - Harry Potter e-books. PROJECT GUTENBERG - "Free ebooks." The first producer of free electronic books (eBooks). The place where you can download over 49,000 free ebooks to read on your PC, iPad, Kindle, Sony Reader, iPhone, Android or other portable device. REFERENCE GLOBAL - Walter de Gruyter is among the first academic publishers in the world to provide electronic access to its journals, books, and databases on a single platform. scribd - since 2007. "Read Without Limits." Enjoy an unlimited number of books, audiobooks, magazines, and more. We're changing the way the world reads. Unlimited audiobooks, ebooks, and magazines, available on any device for only $8.99/month. SMASHWORDS - "Your ebook. Your way." "Smashwords is the world's largest distributor of indie ebooks. We make it fast, free and easy for any author or publisher, anywhere in the world, to publish and distribute ebooks to the major retailers." THE DIGITAL DEAD SEA SCROLLS - in partnership with Google. THE ONLINE BOOKS PROJECT - "Listing over 1 million free books on the Web." W.H. SMITH - "Million of e-Books to suit all tastes."